President Trump has nominated U.S. Air Force Gen. Terrence O’Shaughnessy to be commander of the U.S. Northern Command and the North American Aerospace Defense Command. The Defense Department said TuesdayO’Shaughnessy currently leads the Pacific Air Forces and serves as air component commander at the U.S. Pacific Command and executive director of the Pacific Air Combat Operations Staff. 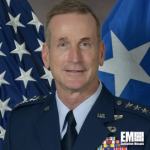 He assumed these roles in July 2016 after he previously served as deputy commander of United Nations Command Korea and U.S. Forces Korea, as well as air component command leader at the South Korea/U.S. Combined Forces Command and head of the 7th Air Force in South Korea. O’Shaughnessy’s also helped shape the Defense Department‘s regional planning and policy within Asia-Pacific and Central Asian regions during his tenure as deputy director at Joint Staff J5 for politico-military affairs in Asia. He logged more than 3,000 flight hours with the F-16 Fighting Falcon aircraft.